Meryle Secrest attempts what many art historians have considered impossible: a substantive, comprehensive biography of the life of Amedeo Modigliani. His short, tragic life and career have been fodder for countless enduring myths, his death shrouded in mysteries and his painting and sculpture ripe for thieves and forgers. Secrest mentions “experimental” biography and, indeed, her treatment might be one to get to certain verifiable truths about the artist and his times. Her combination of passion, authority and rhetorical approachat some points, squirrelly. Secrest describes how she must separate facts and fiction, for instance, but, some of her stream-of-consciousness is too tangential and distracts from the main character. The author acknowledges that little remains known about the artist’s childhood, so she basically leaves that out, filling pages with family background and art history. Modigliani makes an entrance when he enters art school at age 13, with the famed Italian teacher Guglielmo Micheli. The young artist barely survives typhoid fever and tuberculosis. How he “evolved from a gravely ill adolescent to someone committed to his talent and future as an artist is closed to us,” Secrest writes. Her background of the prevalence of TB and other diseases plaguing Europe at the time is interesting but a tutorial on them is better suited for endnotes. 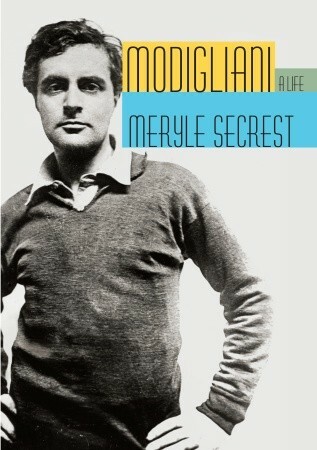 Secrest eventually conjures the intoxicating scene in Paris, the nexus of the arts revolution, when Modigliani arrives healthy and ready to live the bohemian life among the famous and the infamous. Cocteau called Modigliani “our aristocrat.” He is viewed by contemporaries as attractive and talented at a time of social and intellectual experimentation. Modigliani emerges as a man of singular vision, in and out of the changing vanguard, in and out of poverty, in and out of love and in and out of popularity. His drug and alcohol use were part of his defense against TB flare-ups and other illnesses that brought him near death several times. The artist was often completely destitute—homeless, drunk, moving from studio to studio. He wanted to sculpt, but because of costs and time, painting became more practical. His relationship with other artists was one of mutual respect, especially with Picasso, even though they were competitors. His work was not included in the famous New York Armory show in 1913, which introduced the United States to the modern movement and the crop of artists riding that wave in Europe, led by Picasso. Modigliani did not consider himself part of the established abstract innovators. His primitivism (separate from the cubist movement) inspired by artistry found in African art, had its technical foundation in classicism. Modigliani was eventually picked up by a dealer who knew how to broker his work. Unfortunately, as he was starting to enjoy recognition, his health was more and more precarious, yet he was producing more paintings than ever—over 50 a year—in the last phase of his life. More tragedy comes as he started to sell work and line up commissions as his health deteriorated. His relationships are sketchy, some passing mentions of affairs with models. The most significant one pops up halfway through the book, a writer, Beatrice Hastings, described as “a New Woman emerging from the detritus of the Victorian Age, abandoning her corset, shortening her skirts, smoking, drinking and taking lovers.” The other significant relationship written about in much more linear fashion than his other loves is with Jeanne Hébuterne, a young model-artist who was pregnant with her second child with Modigliani when he died. She was so distraught that she jumped out of a window and ended her life and the life of their second baby. Secrest doesn’t exploit the tragedies, but the background info with details of scores of personages dropping in and out, not to mention rambling ruminations on art make some of this tough going. When Secrest stops veering off on related topics, there are whole chunks of the book where all of her art expertise comes together to move the story of Modigliani’s life along in vivid detail.